This Video uses a Relay Mod as well that we did not Document here but you can see the look of the mod. First thing is to Remove lower Driver side dash panel by removing the 3 screws and disconnecting the Vent selector Vacuum line and Kick Panel Lamp. Now Look to right of steering column and you should see black connector that's about one inch with two wires. Test by turning on lights. Test to be sure headlights still pop up by pushing manual button and with the High Beams. 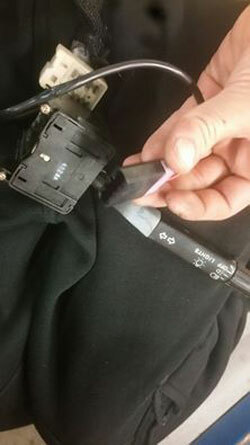 For all models, the connector is in approximately the same location. 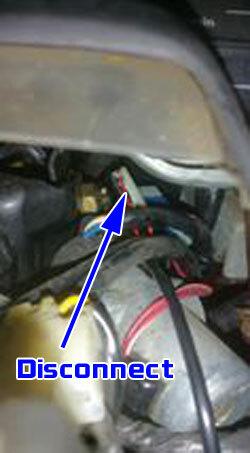 Sometimes the connector is hidden by other wires as shown here. The headlights Will remain up once the high beams are turned on or the switch is used to raise the headlamps with this version of the mod. The Video above uses a Relay mod that disables this fully and only allows the Pod switch to move the headlamp motors.